Chicago’s Urban Prep Academy (an all-male charter school) just pulled a THREE-PEAT announcing that ALL of their graduating seniors have been accepted into four-year colleges! At a time where faith in the traditional educational system is beginning to waiver for many, Urban Prep Academy on Chicago’s south side must be doing something right. Once again, 100% of its 2012 graduating seniors are heading off to college in the fall. 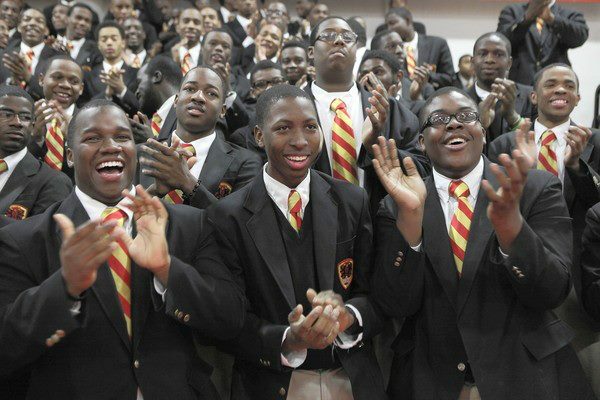 And by the way, this school is the only all-Black, all-male public prep school in Chicago! This is the third year in a row that the school has achieved the feat thanks to hard-working teachers, parents and of course…the amazing students. The school started with students whose futures had been left for dead by their public schools: Only four percent of the school’s incoming freshmen were reading at grade level when they arrived on campus. The young men at this incredible school are reason for hope and celebration as they continue to break barriers and defy the odds! What an inspiration! ?